Mankind learned thousands of years ago that you can't control the weather. And Mother Nature simply doesn't seem concerned that people prefer to stay warm and dry. Lucky for us, this Wrangler Men's Charcoal WJ40 CH Water Resistant Insulated Jacket helps us adjust t ... (see full details) (see specifications) #WRGWJ40CH. Mankind learned thousands of years ago that you can't control the weather. And Mother Nature simply doesn't seem concerned that people prefer to stay warm and dry. Lucky for us, this Wrangler Men's Charcoal WJ40 CH Water Resistant Insulated Jacket helps us adjust to the weather -- because it's pretty clear Mother Nature isn't going to change her ways. This charcoal grey design is made from a sturdy 7.5-ounce canvas weave. The canvas construction makes the Wrangler jacket water-resistant, so rain tends to slide right down. A combination of lightweight 60% lightweight cotton and 40% wrinkle-resistant polyester come together to give you a durable, comfortable work jacket. While airy cotton breathes around your body, tough polyester stands strong and durable against the elements. Inside, you're snuggled into a 100% fleece lining. The soft material inside creates insulating warmth, wrapping around you like a comfortable blanket. The zippered front goes all the way up, stopping at the collar. Even the inset side pockets don't interrupt the sleek front. It's a straight, simple design, ready for work. Back yokes, full underarm gussets, and action elbows give you a full range of motion. Use the adjustable cuff closures to get a comfortable fit, and you're ready to take on the day...no matter what's waiting for you in it. Double-needle stitching gives you the power of two threads along the seams and creates a clean look for your new Wrangler workwear jacket. You can't count on the weather to change for you, but you can count on this Wrangler Men's Charcoal WJ40 CH Water Resistant Insulated Jacket to provide sturdy protection when things get chilly and damp. I am an avid motorcycle rider and I like to look good when I ride. My cruiser is black which is why I bought the jacket and with it being lined it just makes for an easy choice to ride with this jacket. I've got more cruiser clothes I want to buy and this is an item that almost completes the wardrobe. 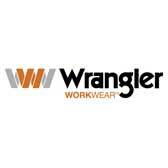 Wrangler Workwear Jackets: Men's Charcoal WJ40 CH Water Resistant Insulated Jacket is being added to your cart.